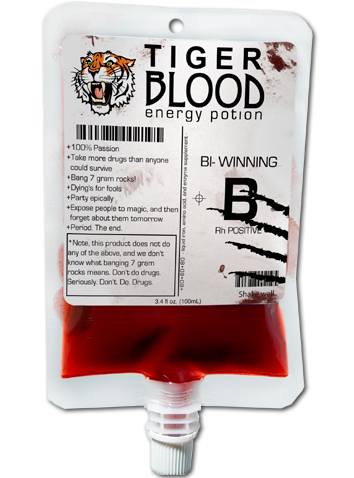 We have decided to do a limited edition of one of our products, converting it into Bi-Winning Tiger Blood, made of 100% passion. It’s a 3.4 oz energy shot that comes in an IV bag for $3.99. It’s only 80mg of caffeine instead of a 7 gram rock, but you can still bang it! See it in all its winning glory at our webstore. This entry was posted in Uncategorized and tagged #winning, blood, tiger blood, tiger blood energy drink, tiger blood energy shot. Bookmark the permalink. Is this available at ihavetigerblood.com?????? But but, what about the adonis DNA? I want that…..
…but will it give me warlock powers?